In Vancouver this Friday? Pop by my studio for a visit! 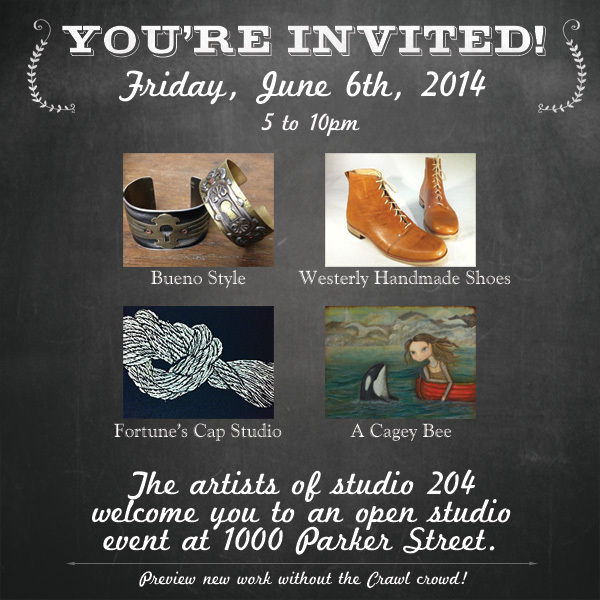 Studio #204 in the creative talent labyrinth that is 1000 Parker Street is hosting an open studio event from 5 to 10pm on June 6th, 2014. You can see brand new work, paintings still in progress plus have a glass of wine & a chat without the madness of the crowds that the Culture Crawl brings. I’m lucky to share my studio with an incredible group of talented ladies including a shoemaker, a jewelry & a traditional print maker. Aside from making incredibly cool stuff, they’re also incredibly awesome people. Swing by & say hello! Next postThe Friday Night Event You DO NOT Want to Miss!